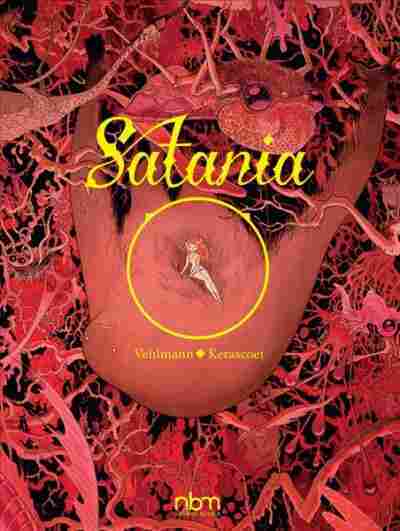 French Graphic Novel 'Satania' Breaks New Ground — Underground Halloween is a time for surprises, so it's a great time for Satania, by Fabien Vehlmann and Kerascoët — it's a thoroughly surprising story about a young girl searching for her missing brother. Halloween is a time for surprises, which makes this a great time for the release of a new book by Fabien Vehlmann and Kerascoët. In 2014 this French team summoned the creepies with Beautiful Darkness, a ghoulishly comic tale in which tiny people lived on the decaying corpse of a small girl left in the woods. Like its predecessor, Satania seems to burst forth from an innocent, morally chaotic imagination. It's not actually a story about Hell, nor is it a fantasy — or, not exactly. What it is, is thoroughly surprising. True, there are familiar rudiments here: Charlie, a teenager on a quest for her missing brother, joins a ragtag group of explorers on a journey to (well, toward) the center of the earth. Charlie is innocent, earnest and resourceful — pretty much the standard-issue Spunky Girl of a zillion stories. But what she finds as she and the team descend is wholly unexpected in both content and tone. It turns out there's plenty going on underground. Monstrous life forms dwell there, and something in the cave air makes the explorers slowly lose their minds. Vehlmann follows throughlines unpredictably, and Kerascoët's style — reminiscent, as reviewers of Beautiful Darkness noted, of Tove Jansson's Moomin books — brings an unsettling sweetness to scenes of horror. The art is also straightforwardly beautiful, making for a delightful visual experience even when young Charlie and her comrades are edging their way through dark caverns. Kerascoët (actually the married couple Marie Pommepuy and Sébastien Cosset) do let some opportunities go by early on — a huge underground city, the explorers' first big discovery, lacks brio. But the artists' energy heightens as Charlie descends, while the story gets tighter and stranger. When the bizarre conclusion begins to unspool, events blaze across the page in an ecstatic riot of line and color. Kerascoët have thought carefully about the most effective ways to help Vehlmann tease and discomfit the reader. The characters are drawn with varying degrees of realism and different cartoony characteristics, making them seem almost like different species (and sometimes they are). One explorer's goofy features become a kind of ghastly joke as his fate unfolds. Charlie is generically cute, but her black button eyes have an alienating effect. And the character who's drawn most relatably, a Kris Kringle-ish priest with wide eyes and friendly whiskers, turns out to have the most opaque motivations. Like Vehlmann, the artists are determined to follow one rule: Nothing here is what you'd expect. That's the root of Satania's success — and also of its numerous failures. The characters aren't classic "types," but they aren't all that well-established or differentiated either. Charlie herself has little personality besides the requisite pluck. She's given a tortured backstory, but it feels simultaneously stingy and pointless. Even if it falls short ... this book's sheer oddness remains mesmerizing — and not just because it's so appealing visually. Vehlmann also trips up with the pacing. The narrative stutters along indecisively until the action-packed final third. Even then, after a series of rollicking sequences, the very last pages imply that the most interesting part of Charlie's adventure has been left untold. Other choices throughout the book were clearly intended to tantalize the reader, but this omission just seems like a failure of stamina. Even if it falls short, though, this book's sheer oddness remains mesmerizing — and not just because it's so appealing visually. Satania may not be as weird as Beautiful Darkness, but Vehlmann has dreamed up some truly unexpected twists and trimmings for a quest tale that's the antithesis of formulaic. It's as if, by heading underground, he's managed to leave all the old stories (well, most of them) behind. You'd never guess the depths would be so refreshing.